NEW YORK — The hottest new toys in the cosmos will be showcased at an international convention starting here on Sunday (Feb. 10), including lots of games and gizmos with a space flair. The 110th American International Toy Fair exhibition runs from Feb. 10 to 13 at the Jacob K. Javits Convention Center in Manhattan. More than 1,000 toy makers from around the world, including Mattel Inc., Playmobil U.S.A. Inc., LEGO Systems, Inc., Crayola and Hasbro, Inc., will be showcasing their wares at the four day event, a hub for distributors, importers and retailers. The exhibition is open only to trade and media representatives. SPACE.com will be searching out all the space robots, astronaut action figures and model spaceships on offer at the event, and we'll hand out our second annual Space Age Toy Awards, honoring the coolest new products in six categories: Best High-Tech Toy, Sci-Fi on Earth, Cosmic Space, Little Scientists, Retro Future, and Do-it-Yourself Science. We'll announce the recipients of our trophies Feb. 13 at the Toy Fair. 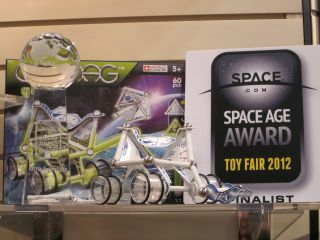 Last year's Space Age Awards honorees included Future Planet from Playmobil, Geomag GLOW Moon Explorer from Reeves International, SketRobo from Tosy Robotics JSC, "Star Wars" Science Force Glove from Uncle Milton, and the New Space Age Crystal Growing Kit from Kristal Educational.